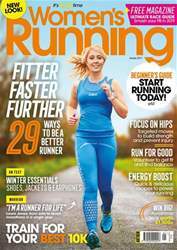 Digital Subscriptions > Women’s Running > January 2019 > START RUNNING today! Got a pair of trainers? Great! Then welcome to our tribe. Get fit and feel great with our easy guide to starting out. With just a few pieces of essential kit, and a super simple routine to kick you off, we’re with you every step of the way. Come and run with us! The New issue of Women's Running is available now! Should female runners take supplements? The ½ PRICE SALE Subscriptions from just £6.75!